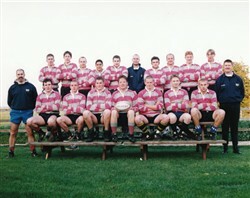 Olney RFC colour team photograph of the Olney RFC Colts XV season 1996-97. Players listed as E. Warren, S. Harrison, K. Jordan, S. Kamali, M. Damell, J. Cox, T. Coe, M. Chaplin, D. Smith, C. Montague, M. Holloway, D. Meech, L. Dennis, R. Blenkinsop, E. Harper, C. Taylor, G. Cook, Coach: R. Davis (Assistant), Manager: A. Tebby. Players not pictured: G. Dainty, N. Purcell, O. Brackenberry, A. Little, R. Mallen, B. Christmas, L. Saunders, B. Eley, S. Chandler, C. Sudds, M. Watts and F. Lee.